If a tree falls in a forest, does it make a sound? If you have boundaries, but don’t ask for them to be upheld, do they really exist? Okay, I ask this question in jest, but seriously! 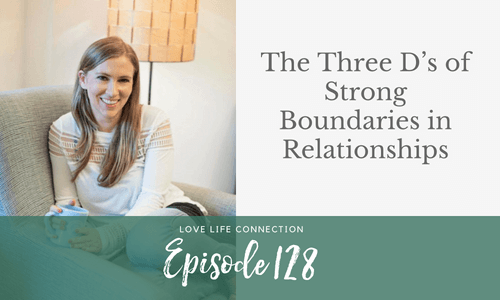 There are three parts to every boundary you have, and without these three parts, your boundaries don’t really exist. You can have all the boundaries you want, but if you aren’t actually following through with them, then they mine as well not exist. I know that sounds harsh, but I can’t tell you how many women tell me they ‘already know their boundaries.’ That might be true, but just knowing them isn’t enough. Want to break free of your unhealthy dating patterns for good? Join me for my free workshop, Uncover Your Dating Patterns. Sign up for free HERE. Constantly attract unavailable guys and really like them, but also meet available ones that I’m not attracted to at but should be and deflect them. I thought I was pretty open about what I want – but realise that I don’t do the follow through and end up cruising along with what the guy wants and not what I want… I’m a people pleaser I think mayb…. ?